A memoir when you're still a teenager may seem premature, but not for Mo'ne Davis, the first female pitcher to win a Little League World Series game. "Mo'ne Davis: Remember My Name" will be released next March by HarperCollins Children's Books, the publisher told The Associated Press on Monday. The honor roll student from Philadelphia became a sensation last summer after leading the Taney Dragons to a 4-0 victory over Nashville when she was just 13. Known for her long braids and uncommon poise, she has since appeared on the cover of Sports Illustrated, thrown out the first pitch at a major league World Series game and starred in a car commercial directed by Spike Lee. In September, she donated her jersey to the baseball Hall of Fame in Cooperstown, New York. 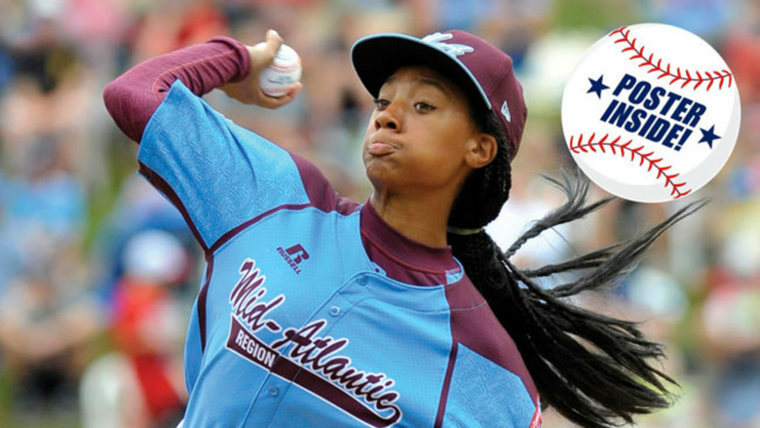 "When I joined an all-boys baseball team, my mom wasn't too happy," Mo'ne said in a statement issued Monday through HarperCollins. "I proved to her (and to me) that I could do anything I set my mind to. I'm just a girl that likes to play sports and I'm excited to share my story with everyone," she said. "I hope it encourages people to take a chance and play the sports they want to play and not just the ones people expect them to play." Later this month, she and her fellow Taney Dragons will help kick off the Macy's Thanksgiving Day Parade. Financial terms for the book deal were not disclosed. Author Hilary Beard, whose previous collaborations include "Promises Kept: Raising Black Boys to Succeed in School and in Life," will assist Davis with her memoir.